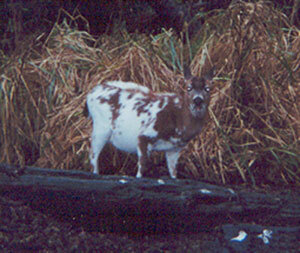 On December 22, 2000, Tom Tollefson took the two pictures above while at Lake Ozette in Washington state. 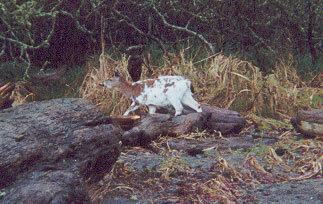 If you look at its tail you can see that this is a blacktail doe deer with a very interesting coat. It is hard to tell, but the eyes do not appear to have the pink color of an albino. So what do you think caused this coloration?